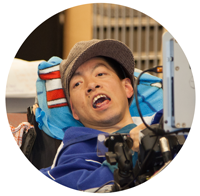 We are a group of community members with cerebral palsy who work together with youth participants in a mentorship capacity. We believe that through sharing our experiences, we are able to create a positive and educational environment where young AAC users can learn new ways to let their inner artist shine. in artistic collaboration with their peers and expressing their unique ideas, stories and identity through performance. other artists with disabilities to become part of a vibrant community. as a collective of devised theatre artists, who work across physical and communication boundaries. 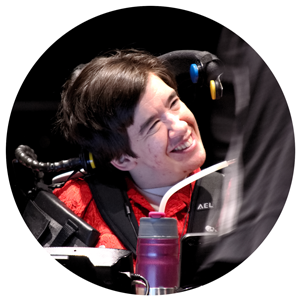 "I liked being aleader, and helping others with CP see the value of story making was very rewarding. I feel the leadership team and I are all stars"
I am happy to be a leader, I like it when new people join, because helping them perform and create makes it feel as if we are all connected as one group.